I read almost all of the aviation trade papers and magazines as part of my job, and some are far better then others. 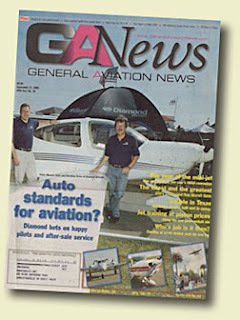 I skim a few of the comps that drop on my desk, but one publication that I read cover to cover each issue is General Aviation News. It's not because they are based here in the Pacific Northwest, but because I can identify with their writers, who share a writing style very close to mine. And one of those writers – CFI/CFII Meg Godlewski – recently earned her multi-engine rating, following a path to that ticket that is (a) very notable, (b) completely memorable, and most of all, (c) it is an “odyssey” we have all lived ourselves. First, let me say that I do not know Meg, unless you call reading her in GAN “knowing” someone. But in my world, we pilots are all family, and it gives me great joy to know a family member has kicked it up to the next level. "The best things about getting the ME rating was that as a CFI/CFII, I spend a lot of time in the small airplanes letting someone else fly. It was nice to be in the left seat again and I like flying the twin because it requires me to have my “A-game” all the time because things happen so quickly." "The worst things about getting the ME rating was getting all the ducks in a row. I had to save the money, and some unexpected big-ticket expenditures (like replacing the engine in my car) ate up the funds at least twice. I then broke my arm and there was definite loss of strength. I tried to fly a simulator with the cast on and it hurt so bad I decided never to do that again. When I got the cast off I hit the gym really hard to build up my strength and muscle endurance. I did exercises at the gym that mimicked the control movements I had to do in the airplane. There was a lot of leg press (rudder) and one-armed dumb-bell rows (yoke) in my workouts. The strength training paid off and after a few weeks of that I had no trouble in the airplane whatsoever." "I plan to become a multiengine instructor with the rating. So many people get the MEI ticket as a means of building their hours to get to an airline job. 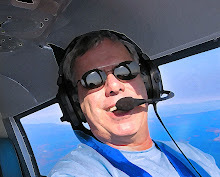 I became a flight instructor because I enjoy flying and teaching people to fly. I imagine I will enjoy it twice as much when I do that in a multiengine aircraft." I have always wanted to step it up a notch myself, and a ME rating would be Oh So Cool. So major hat tip to this new twin pilot, who with her perseverance has taught us that nothing comes easy in our aviation world. And if you want to achieve great things, it requires your “A” game...something this writer/CFI/pilot apparently knows how to deliver. You'll want to stroll over to GAN and read the whole story here. And while you're there, do yourself a favor and subscribe...you have my word, they will not disappoint.